Motorola. A Google company. It's time to commit that to memory. With the Moto X, a 4.7-inch phone going on sale later this summer for $199 on contract, the company has officially started the shot clock for the "new Motorola"; this is the first Moto product designed from scratch with Google's direct oversight. And it shows, from the packaging to the messaging to the features aimed at mainstream users. Most importantly of all, there's Moto X's standout feature: personalization. We've been hearing for years from various OEMs that smartphones are a personal statement, a reflection of the individual, but aside from the occasional color option, the wallpaper and case have been the only real opportunities for personal expression. Well, you can kiss those days goodbye. Motorola's keyed in to a core part of the user experience -- self-styling -- and we expect its rivals to follow suit. But all of that backstory can wait. 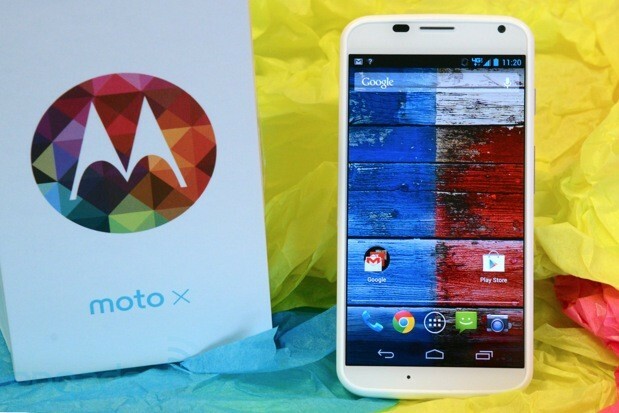 We need to talk about the Moto X. The company never explicitly said so when it showed us the phone behind closed doors today, but this is clearly a mainstream phone (it's geared towards the "majority of users" several execs told us). To that point, its spec sheet and feature list (Touchless Control, Active Display, Quick Capture) won't dazzle the technorati. And, from what we can tell, it's not supposed to. To hear the company tell it, the Moto X's journey began one year ago with a whiteboard listing all of the most common user problems, ways to address those issues and a plan to get the device into as many hands as possible. You won't be able to assess that for yourself until the phone launches on AT&T, Verizon, T-Mobile, Sprint and US Cellular later this summer. 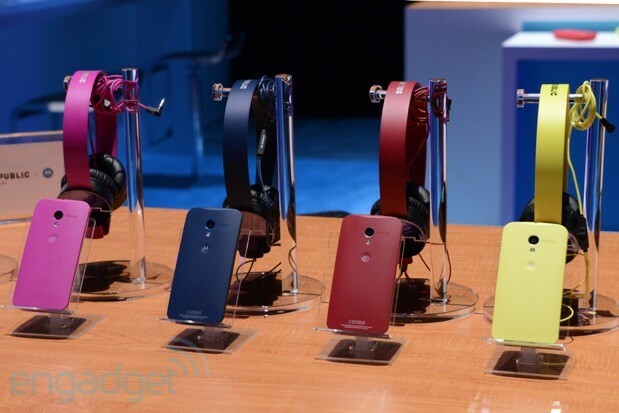 For now, though, if our initial hands-on time is any indication, it appears Motorola's succeeded. The Moto X's curved shell, reminiscent of some other phones we've seen (e.g., the HTC 8X, Droid DNA) was chosen for the way it conforms to the palm of the hand. The same emphasis on comfort applies to the 4.7-inch screen size, which takes up nearly 70 percent of the front face (of note: Motorola didn't apply its "edge-to-edge" marketing lingo here). Why settle on that 4.7-inch size and not something larger or smaller? Simple: it's the sweet spot users want, or so intense focus testing seemed to indicate. There's no 1080p panel, either. The Moto X employs a 720p AMOLED display, a choice primarily made to help the 2,200mAh battery live up to its promise of 24-hour battery life. Besides, most users won't notice any appreciable difference between this and a full HD panel; viewing angles are great and colors pop. As for imaging, there's a 10-megapixel Clear Pixel (RGBC) rear module capable of pulling in 75 percent more light for faster daytime exposure and low-light performance. It's also bolstered by the Quick Capture feature, enabled from sleep by a double twist of the wrist, which allows for a sub-two-second shot-to-shot speed. As for autofocus and exposure, those are handled automatically. Make no mistake: the Moto X is pleasing to hold. It's light without feeling cheap or fragile, yet solidly built and gently curved. The plain white and black models, standard for all five US launch carriers, are actually rather humdrum; they don't immediately shock the senses into gadget-lust mode. 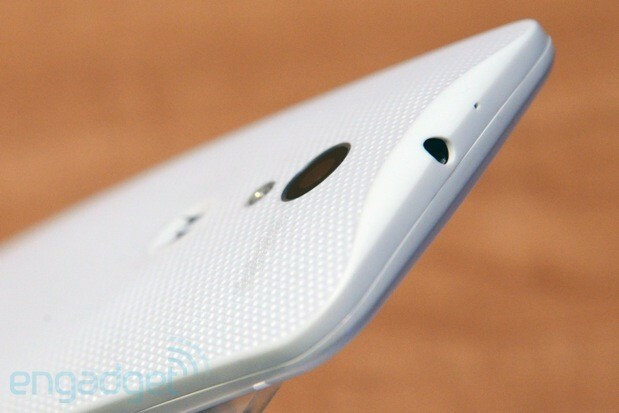 Survey any of the custom Moto X handsets, however, and your drool response will be immediately triggered. To snag one of those truly personalized handsets, you'll have to visit the dedicated Moto Maker site (check out our separate hands-on), which will initially launch with AT&T as the sole partner. Make no mistake: the Moto X is pleasing to hold. From there, users will have several color choices to make regarding the front (black or white), back (Cool, Neutral and Warm options) and accent trims, with seven options to choose from in that last step. Custom wallpapers and personalized inscriptions are options too. Finally, you'll need to decide if you want to upgrade to 32GB of internal storage (that costs $250, compared with $199 for the base 16GB model). It's important to note that all custom models sold through Moto Maker will ship four days from the time of order (made possible by the Ft. Worth, TX manufacturing facility) and arrive with unlocked bootloaders. If you choose to go the carrier route, only T-Mobile and Sprint will be offering unlocked models from the jump. Additional developer versions, plus an unlocked Google Play model will be made available at a later date. Oh, and it requires a nano-SIM, too. Someday soon, you'll be hearing awful innuendo from the tech press proclaiming, "They've got Wood for the Moto X." Why? Well, by Q4 you'll be able to purchase a Moto X made entirely of wood -- well, its backplate, anyway. Motorola's keeping its eye fixed hotly on trends and those current trends dictate that people like the use of new materials for their accessories -- wood being among the most immediately interesting. As you'll see in our photo gallery, we were able to test out some of these wood prototypes, though company reps were quick to reinforce that these models were still in the testing phase, as various woods react in different ways. Imagine a handset chassis that warped over time due to a toasty CPU -- neither you, nor Motorola want that. At present, the company's designers are testing out four wood types: Teak, Bamboo, Rosewood and Ebony. When these wood variants clear testing hurdles, users will be able to build them from the Moto Maker site. 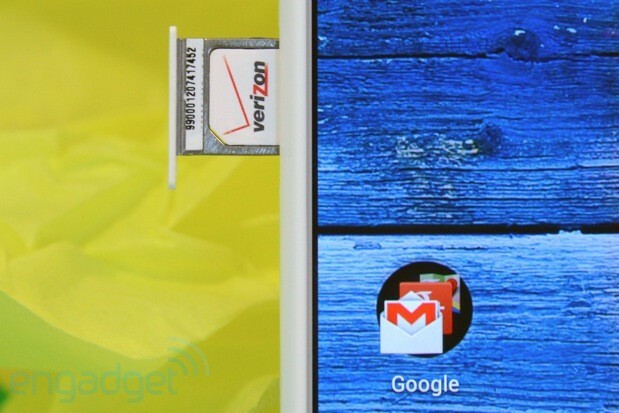 Did you happen to pay attention to last week's Verizon Droid launch? If so, then most of the Moto X's bell and whistles should sound familiar. There's a shared heritage: the Moto X and newly updated Droid line pack essentially the same specifications, right down to the custom X8 chip and 2GB of RAM. As a refresher, Motorola designed this shared custom chipset with an eye on battery life -- specifically, its ability to handle tasks like Touchless Control (triggered by saying "OK Google Now") and Active Display notifications from a low-power state. Inside the heart of the X8, there's a dual-core 1.7GHz Snapdragon S4 Pro, a quad-core Adreno 320 GPU and two custom processors -- one for natural language and the other for contextual computing. It's a bizarre move on Motorola's part, announcing the new Droid line before the Moto X, a phone that's clearly its hero device. And a point we asked Lior Ron, Corporate VP of Product and Steve Sinclair, VP of Product (much to their chagrin) to clarify. From what we could ascertain, certain contracts with Verizon had already been in place and a push to move the Droid launch timing would've proven too costly. No matter: the two product lines are geared toward different users anyway. The Droid line focuses on early adopters with performance and masculine design, whereas the Moto X goes after the mainstream with approachability, personalization and user experience. As Ron plainly put it, "We're aiming for user specs... what matters to the user." 41-megapixel cameras, 1080p panels and quad-core processors will have to wait. Ron assured us higher-end Moto X iterations are in the pipeline, though he wouldn't elaborate on when, but ultimately the specs on those models have to benefit the user. Translation: if it slaughters battery life or offers up an overwhelming array of software options (e.g., camera UI settings), it probably won't find a home in a Moto X device. You're probably wondering what the deal is with Android 4.2.2 on Moto X. Is it stock like on a Nexus or lightly skinned like we've seen on last year's Droids? You're probably wondering what the deal is with Android 4.2.2 on Moto X. Is it stock like on a Nexus or lightly skinned like we've seen on last year's Droids? Good news, purists, the OS is near vanilla. Naturally, Motorola made specific hardware / software tweaks, like creating a special stack for the Quick Capture camera and segmenting notifications in a buffer for Active Display. That right there is the line in the sand drawn between Nexus and something Moto-made. Does that preclude a Motorola Nexus? Not necessarily. As Ron explained, "Sundar and the Android team have their Nexus policy. We are an OEM participating in that like anyone else. There is the potential and it's not something to rule out." We've certainly heard that line several times before, so we'd hazard it's now only a matter of time.